Here's what I think every family-friendly restaurant should offer---childcare! You get together with a group of friends at a restaurant. Drop the kids off in the Kid Zone or whatever it might be called. The kids can play, nosh on pizza or chicken nuggets. And, the adults eat, drink and talk. Yes. Actually talk to each other without breaking out the Legos or crayons or picking up food off the floor. Wouldn't that be amazing?? As far as I know, nothing like that exists. But, maybe one day right? Until then, we meet up with friends at the most kid-friendly places possible. When it's just Scott, the kids and I, we brave fancier restaurants, and we just expect the kids to sit and behave. But, if you throw their friends into the mix, it's an entirely different environment. We have tried JJ Twigs in Lake Zurich twice with friends and their kids and it has been a great experience. The kids are given popcorn as soon as they sit down and the pizza is great. I love the Mexican pizza, but the kids are happy with just cheese. I'm so not a video game fan, but I let my issues slide for a night. JJ Twigs has a video game area that keeps the kids busy until the quarters run out. The waiters and waitresses are so laid back they don't mind a handful of kids running around the lobby like crazies at the end of the night. While the food isn't sophisticated or healthy, it's fun for a get together with friends. The first cell phone I ever used was a clunker. Technically it was my parents’ “car phone” that I had borrowed while going out for a night with college friends in Baltimore. I remember stuffing the huge phone into my purse, so proud that I actually had a “cell phone”. I don’t even think I knew the phone number. But, it was pretty much the greatest thing ever that night. Being able to call anyone anywhere was just the best. After college, I racked up major phone bills…that was obviously before unlimited phone calls and a few years before texting. Then, of course came the smart phone. I was a little slow to buy one. I remember thinking it was an extravagance I just didn’t need. But, when it came time for an upgrade, the Androids were pretty cheap. Next came the iPhone and I was in love. FaceTime, iMessages, Uploading photos to Facebook automatically. It was all completely wonderful. Until it died. Last week my iPhone just completely stopped working. No warning. No reason. Just done. At first I was devastated. How would I text? What if people were trying to call me? I couldn’t upload pictures to Facebook! How would life go on? It was complete unnerving silence. Then, it became almost like a vacation---being unreachable was kind of fun. Like an adventure. I called people on the home phone. I met up with a friend for breakfast by arranging a time and place. No texts or cell phone calls. Somehow she found me at the back of the restaurant. When waiting in a grocery line, I talked to the kids instead of playing on my phone. And, I remembered all my assignments and appointments, even though I didn’t have my iPhone calendar or reminders. I was completely capable without my iPhone. Two days without a cell phone or smart phone and I survived! I got the call this morning...the very first call I received from Julie all by herself. I could just picture her dialing the number on the school office phone. This had to be good. "I forgot Scorch. Can you bring it?" Scorch is a stuffed dragon in Julie's class. He's special. Each kid probably only gets to take home Scorch every two months...if they're lucky. Last night was Julie's night. She was supposed to bring him back to school, along with a story she wrote about him. She left him at home, and the assignment. "Julie...." I trailed off. I was tempted to give her a mini lecture, but I envisioned the secretaries listening in. Was it on speaker phone? "I can't come right away," I told her, as I was on the way to drop Johnny off at preschool. I was also tempted to not get Scorch at all. Maybe that could be a lesson in responsibility. How would she ever learn if I always picked up the pieces? Monday she left her spelling words at school. Last week she completely lost her math homework. And, at least three times a week she just loses her adorable hair ribbons and barrettes at school. Those cost money. They're from Gymboree darnit! What if I just never came with Scorch and she had to suffer the consequences? I seriously considered that idea, rationalizing that it was actually a better parenting move than going home, picking up the dirty stuffed animal and dropping it off at school. Scott reminded me she was in second grade not high school. Then, I thought about all the times my parents picked up the pieces. Would my mom and dad deliberately let me fail? Would they ignore my calls for help? Heck no. They always came to my rescue. They still do. And, do I love them for it? Heck yeah. Because they made me feel loved. Like I could be who I was with all my faults and mistakes and bad habits. Isn't that the mom I want to be? We had some unexpected guests this weekend. Scott's Uncle Bob and Aunt Sue were traveling across country for their 40th anniversary. On their way back to California, they decided to stop in Chicago. When we have guests in town, we always want to show off Chicago's dining scene. There are so many fun restaurants that Scott and I are always wanting to try something new. This time we decided to give Ditka's a try. Mike Ditka is all Chicago, right?? The restaurant is covered in Bears and Ditka paraphernalia--most of which is pretty funny, though some things are a tad inappropriate for the kids. Overall, it's a fun, happening place. Scott thought "Da Pork Chop" was great, Uncle Bob liked his steak and Aunt Sue enjoyed the roasted chicken. I ordered Perch, which probably wasn't a great idea because I didn't realize it was covered in batter. Not my favorite. The kids of course loved the chicken fingers, but the service was a little slow, and they got a bit antsy. I would say Ditka's is worth a visit, though definitely not our favorite Chicago joint. Gibson's Steakhouse still wins in terms of food and experience...so far. I'm not a breakfast person. Eggs, pancakes, waffles...blech. Don't even talk to me about sausage and bacon. But, I do have a weakness for bagels. There's nothing like a soft everything bagel toasted with vegetable cream cheese and tomatoes. Hummus or lox are also good toppers. Surprisingly I discovered a local pancake place as one of the best places in town to get a good bagel. The bagel platter with lox and cream cheese is amazing. Julie and I had a special breakfast today with some friends at Walker Brothers in Lake Zurich. Julie loved the pumpkin pancakes, her friend gobbled up the chocolate chip pancakes and my mom friend said her personal favorite are the potato pancakes. I happily finished my bagel platter complete with lox, cream cheese, capers, cucumbers and tomatoes. Yum! Walker Brothers first opened in Wilmette in the 1950s, but the pancake restaurant opened in Lake Zurich in 2001, and has remained a popular stop for Saturday or Sunday breakfast or brunch. When Julie and Johnny were babies, I used to love cuddling them in my lap and reading them books. I could have stayed there for hours, but of course they always got squirmy or hungry or tired. As toddlers, I could usually only hold their attention for one short book until they wiggled away to play with something more interesting. If I had it my way, I would just snuggle them forever reading the day away. Much more entertaining to me than playing Barbies or trains. I could never turn down a request to read. As semi-big kids Julie and Johnny love story time. Maybe I brainwashed them, but they still love sitting with Scott or me and listening to book after book after book. And I still love it. I would do it forever, though I know it won't last. I'm not sure when I first started to notice Julie sneaking off by herself to read chapter books. I think it probably started with bedtime. We usually take turns reading chapter books, but sometimes I was too tired to read anymore, and she'd ask if she could stay up a while and read by herself. "Of course!" I'd say. This mom will never ever discourage reading any time of day. Then, there was a night when it all changed. "That's OK Mommy. I just want to read by myself tonight." A tiny part of me was completely exhausted and was kind of relieved I didn't have to read a book for 30 minutes. Another part of me was so thankful that she loved reading. Most of me, however, felt lost. Obviously, I knew it was coming. When I was her age, I spent most of my days reading books. I couldn't get enough. I was completely thrilled that she loved to read. It's just that I'm not ready to give up that time. I loved sharing in the story and asking her questions and seeing whether she could guess the ending, or whether she really understood what was going on. So, I've started to barge my way into story time by asking if I can listen to her chapter book. Or sometimes I'll entice Julie with an interesting book to join in nightly story times with Johnny and me. It's working so far, and occasionally she'll still bring me a book and say "Mommy, read this to me." When Scott first started working in Chicago, he would constantly brag about this restaurant with awesome steaks and crazy desserts. It was Gibsons Steakhouse. 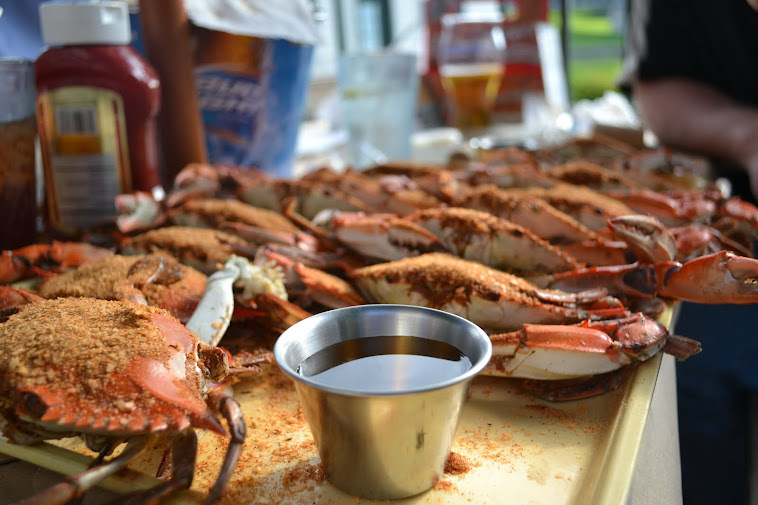 The restaurant is downtown and on the pricier side, so we never ventured there with the kids. But, when our good friends Heather and Grant were visiting we jumped on the chance to indulge. The guys of course went for the huge cuts of steak, which they said were delish. Heather and I aren't huge steak fans, so we opted for the lobster roll, which was pretty good, though I've had a lobster roll in New England, and of course it's hard to compare. What won us over were the insanely huge desserts. We ordered the macadamia turtle pie. It was ridiculous. I mean it was served with a steak knife! Surprisingly we ate the entire piece and were licking the chocolate from the plate. Overall, Gibsons is a fun experience, and a must for tourists. I've always loved Halloween. There's just something about wearing a costume---any costume you want, that's free-ing. I think my best costume as a kid was a refrigerator full of food. So random, but I think I won a costume contest that year. Before kids, Scott and I always went all out for Halloween. One year we were smurfs. Then we were Hungry Hungry hippos. Another year he was the Pillsbury Dough Boy and I was Miss Piggy. We didn't match but it was still fun. Dressing up kids on Halloween is awesome....until they start picking out their own costumes. That takes the creative fun out of it for parents, doesn't it? Obviously kidding...but sometimes I just want to rewind to the days when they were babies and I could dress them up as Kermit the Frog and they would have no clue. I have learned to deal with their choices and try to jazz up the creativity. This year Julie wanted to be Dorothy, which was a totally cute choice. Johnny couldn't make up his mind. He wanted to be a tree. Then a flower. Then a black pumpkin. So, I suggested a lion to go with the whole Wizard of Oz theme. "Yeah. That's good," he said. Of course we had to get our puppy Chico in on the fun. 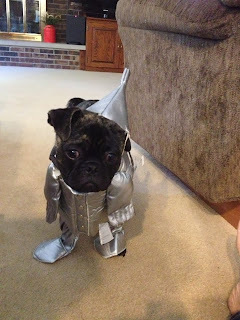 Julie wanted him to be Toto, but that's just kind of boring and predictable. 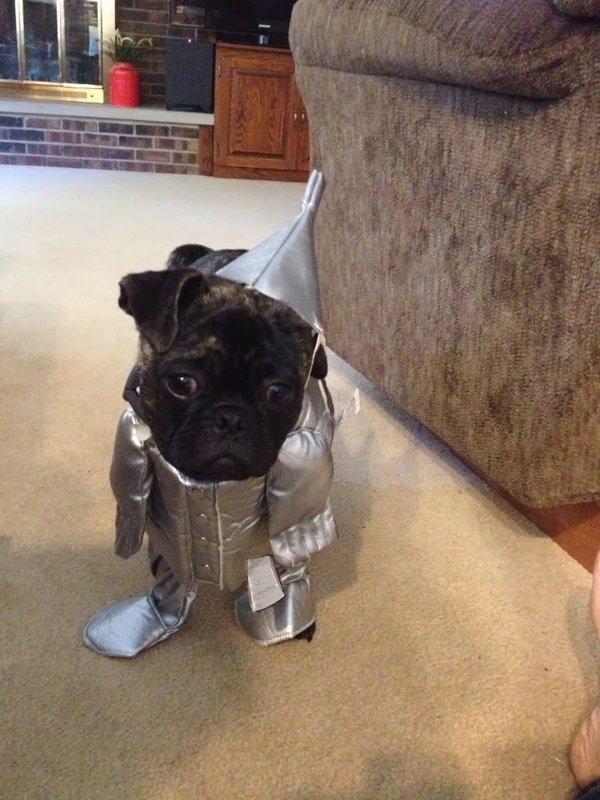 So, he was the Tin Man. Hilarious. And, I can't go a Halloween without dressing up, so I was the Wicked Witch of the West. Scott wasn't a fan of dressing up as a scarecrow, so he was out this year. Next year we have a great idea---let's just hope the kids agree! He still loves us even though he hated his costume. I will get you my pretty! !